Time is passing fast since we have a lot of preparation to do before the snow is coming. One of the most important things in winter will be to keep our place warm, we chopped a very big amount of wood and stored it nicely and dry around Postaja. The second most important thing is that we have enough food to eat, since we do not hibernate like bears (hopefully) will do. We processed fresh cabbage by traditional recept in to 150kg of sour cabbage or in Croatian; kisali kupus 🙂 By conserving the food which can be locally found and grown during this season we did reduced our footprint, by choosing to conserve we will manage to have vegetables during the wintertime when they are difficult to grow. Besides making things sour we also dried many fruits and mushrooms and made some nice jam/sauces. Soon we will also make sure we got some nice drink when we distill the Rakija made of plums, apple and pears, we all look forward to try the new drink! Not only we are preparing of course, also the bears are getting ready for the hibernation. Bears are digging a den and eat themselves fat. We will help them a little by supplying straw and good food. As you might know we have also dogs, cats, ducks, goose and chickens living here, we are preparing winter proof housing for them as well, right now the chicken house is being improved with wooden walls. We are looking forward to the winter, to learn more about local traditions and have good conversations in our best Croatian 😉 To be continued soon when the first snow falls! It’s known that winter in Kuterevo is not the most exciting season of the Kuterevo year. 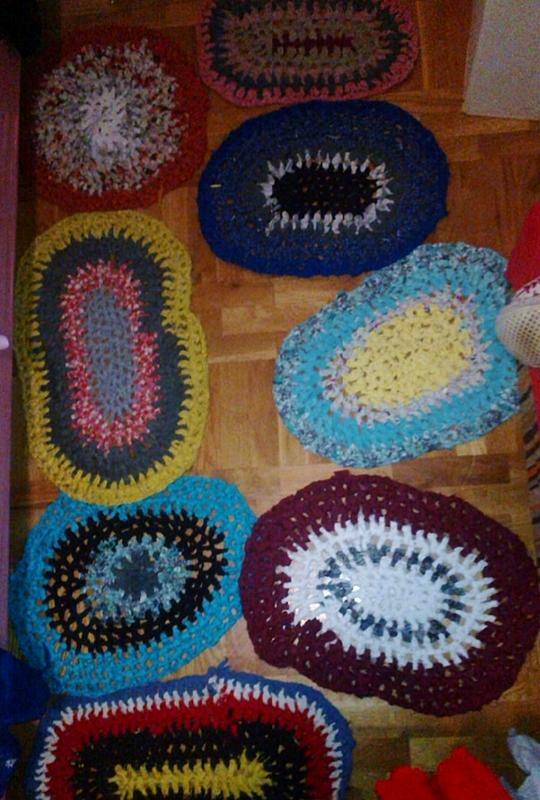 So as my cold and calm winter evening activity I, Kristine, wished to create carpets from old fabrics. It is a technique known all over the world – America, United Kingdom and even some people in Latvia do it, which was a surprise for me. But I learned to do it the Kuterevo way. It is a family evening activity, easy and quite addicting! First, I had to prepare. I cut all kinds of old fabrics, shirts, pyjamas, pants – everything I could find! They need to be cut in 1-2 cm line, depends on the thickness of the fabric. Other volunteers and villagers also helped me to get and cut more fabrics to recycle. To learn the art of carpets I visited teta Dragica. She showed me all the tricks and secrets in perfect carpet making. That is quite easy – all that’s needed is a crochet needle. The crocheting starts from the middle, the carpet grows with every lap. You can mix colors, experiment with different textures and patterns! Now, I spend my days hunting for fabrics and my evenings cutting and crocheting. It’s a good feeling to save old, useless pieces of clothing and give them a new, colorful second chance! But the most important things in cutting fabrics are good company and good scissors. We had bouth in the fabriks cutting party with our neighbours this week. The party was really warm . 25 people in one living room cuting fabriks, trying on old clothes, whach turkish serial, laugh, eat and drink and trying to communicate in a foreign language. Recycling spirit in Kuterevo is very strong. Seems like everything can be recycled in Kuterevo. And It is not just about making new things out of old ones. Recycling in Kuterevo is a lot about having fun with your family, neighbours and friends. Well, from now also with foreign volunteers. Last week Kuterevo volunteers were learning a little bit about how to work with wool. We were combing wool and spinning (making yarns out of wool) by hand during the whole week. First Azat asked a local woman to teach him how to spin the wool and then he patiently explained us how to make woolen yarns with our own hands. Our yarns weren’t as perfect as the lady´s, but they were good enough for Elina to knit out of them. We also attended a workshop in Otočac, in the Traditional Craft Centre, to learn how the wool has been worked in the Lika region over the years. Four kind and patient women, Božica, Dragica, Marina and Lidija, were teaching us different ways to work with wool. These women established their association, Udruga Gačanka Otočac, nine years ago when they realized that a lot of wool is thrown away, and they decided to make something with it. Thus they started to recover all the almost disappeared local knowledge about how to work wool. In the past in the Lika region people used wool from the autochthonous sheep “Lika Pramenka” and washed it in the river. Now that practice is banned because of the pollution of the river with lanolin. According to the Gačanka organisation the wool should be washed with natural soap and then dried on a net. The wool can be dyed with plants: walnut can be used for brown colors, tree bark for yellow colors, elderberries for blue-purple colors. Then the wool is combed with “Gargase”, an instrument made of wood and with nails in the inner part. After the wool has been combed, it should be made into yarns. First the combed wool is tied around a pole. Then the wool can be spinned in two ways. One way is by using a distaff called “kolovrat” that consists of rotating wheels that twist wool fibers. Another way to spin the wool is by using a pole, “vreteno”, which is rotated by hand. With the right hand the “vreteno” is rotated while with the other hand more wool is taken, in the desired thickness of the yarn. To make felt you only need combed wool, water and soap. First you need to put four layers of wool one above the other in opposite directions. After this, you just need to select the topic of the composition you want to do. For that you can use wool or pieces of cloth. When you have your composition on top of the felt, you should wrap the felt with a cloth, covering it completely. Then you need to put a bit of water and soap on your hands and rub the mix on the cloth. After doing this several times you can remove the cloth and dry it. Our compositions and felted flowers are now proudly exhibited to make Postaja more beautiful. Is it possible to make carpets out of t-shirts and wool? Yes, of course it is. First the t-shirts are cut with scissors and made into strips of fabric. After that the strips are put in a device to easily work with the woolen yarns. An ancient loom is used (most of them reach one hundred years) and the woolen yarns are placed in a complicated process (“snovanje”) that only the oldest people know. The strip is passed between two layers of woolen yarns. Each time the strip is passed, a pedal is pushed changing the position of the yarn layers. Then a presser is pushed to make the strip thinner. After repeating this process several times you will have your “Tepka”, that´s how this kind of carpets is called in Croatia, ready to be used. Gagolica? Glago what? What it’s this? The last 4 of January, Nikola, ex-Kuterevo’s Volunteer, was teaching us Glagolica. That is the most old Slavic alphabet. Was used for to translate the Bible and data from IX A.C. It was used before the Cyril and means “to speak”. This alphabet is composed for 41 characters, but some of them we don’t use anymore. As well, they used the alphabet like a numbers as well, because in that time they hadn’t another symbols for that. There is two kinds. 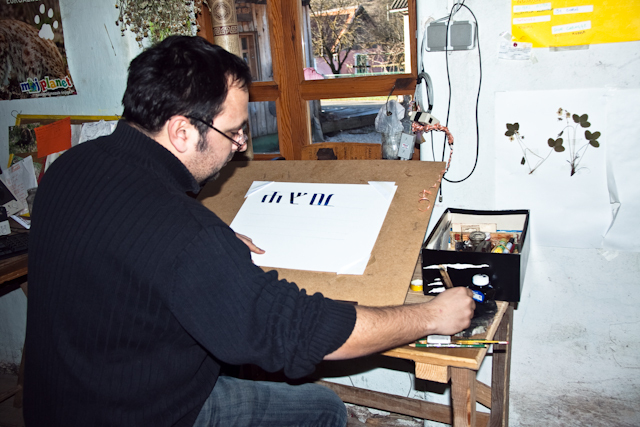 First the Bulgarian alphabet, and then this developed to create the Croatian alphabet with more stylized forms. We have been learning the second one. About the experience, was really great, and all of us were trying to make with the best calligraphy, but was a bit hard in the begining 🙂 . But finally everybody was able to write their own names in a readable way. In my opinion is really great experience learn this kind of things because put the history more close to you and you can understand better everything that was happened in the country. Now every morning I try to learn this symbols and in this way to be able to understand more texts, more language, more life as well 🙂 . Beginning of November… it’s time to make Rakija! Since September, we’ve been collecting a lot of fruits (plums and drenjula), cleaning them and putting them in a barrel so they can ferment… Then we’ve had to wait few weeks before being able to distill them. We were quite impatient to see that!